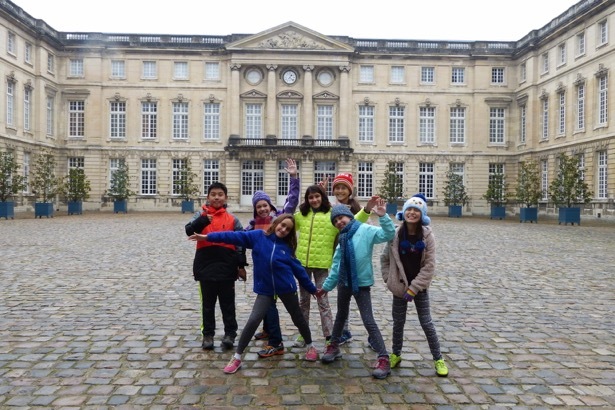 Our 5th grade French Program students are on their cultural exchange trip to Blérancourt, France. They are living with host families and attending school in Blérancourt, as well exploring the many cultural attractions in the surrounding area. Read about their adventures! 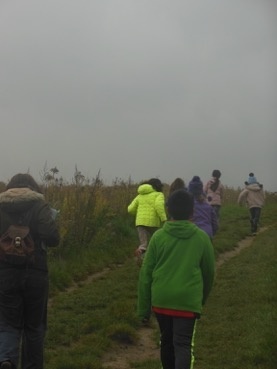 Day 1: Today we had a wonderful time in Soissons, where we participated in several fun activities! We went to l’Abbaye Saint-Jean-des-Vignes, where we were met by our stone-carving instructor, José. 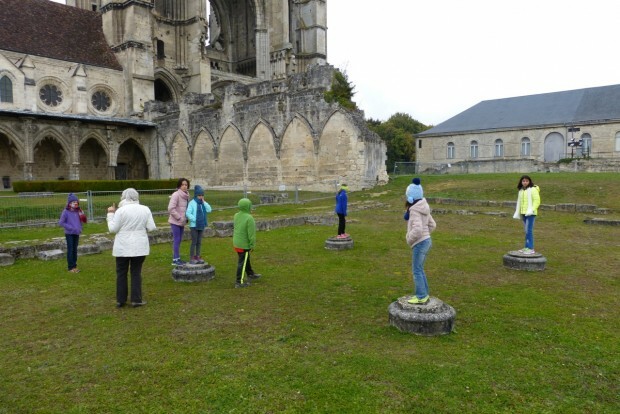 We spent the morning sculpting our own stones into shapes commonly found in the abbaye. The students chose from three different patterns, and using mallets and chisels, each child shaped his/her stone. They all concentrated very hard on their work, and everyone had a great time! After our lunch, we met with our guide for a treasure hunt around the abbaye, and he explained to us how cathedrals were built. The treasure hunt was set up as if it were narrated by Frère Jacques, a novice monk at the abbaye, who had left letters to guide the children. Each letter had a clue leading to another part of the abbaye, where the students found the next clue. The reward at the end of the hunt was candies, found in the ruins of what was once the kitchen. 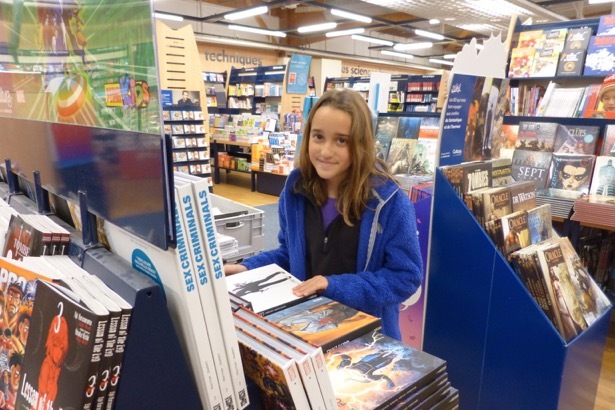 After our fun and educational treasure hunt, we returned to Blérancourt, and the students joined their host families. We hope that they will all have a well-deserved good night’s sleep. Day 2: Today we spent the day in Compiègne. First, we spent a long time perusing and purchasing French books at Cultura bookstore. Not unexpectedly, comics were the most popular choice. It was a rainy day, so we couldn’t have a picnic lunch, and ended up at a café in the old part of town. After lunch, we went to the Château de Compiègne for a guided tour. The château was built by Louis XV and used by the emperors Napoléon I and III. We saw the beautiful decoration in the château, and we were all impressed by the trompe l’oeil paintings on the walls that looked like sculptures. The children took many photos throughout the visit. After the tour, we had a chance to buy some souvenirs in the gift shop at the château. Day 3: Today we went to the Museum of the Great War in Meaux. We were really lucky to visit this museum, as usually no tours are offered on weekends. 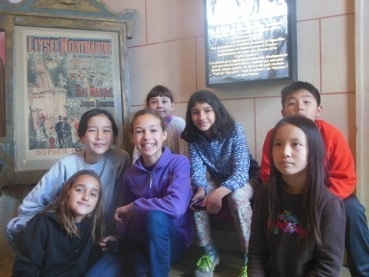 We were able to organize this visit because our own ISTP teacher, Olivier, organized a virtual tour of this museum for our fifth grade students last year. It is a wonderful museum that gives a realistic portrait of the First World War, and the students were impressed by the quality of the tour. After lunch in a crêperie, the students read some postcard exchanges that were written during the war. They then wrote their own postcard exchange, using a period pen that had to be dipped in an inkstand. It was a wonderful day, and memories of this day will remain with the students for a long time. Day 4: After a lunch with their host family, the students went to the compagnie d'archerie to do tir à l’arc, or archery. Students learned about the different types of bows and arrows that one can use. Each group had one of the archers from the archery club help them and teach them how to properly shoot. We had some natural champion archers, and everyone enjoyed himself/herself. After this activity, students had a snack, and went out to play, before being picked up by their host families. Day 5: Today we went to Auvers sur Oise! The day started out very foggy and chilly, but it ended up dry enough to tour the city in the afternoon. We took the bus to Auvers sur Oise, where we visited the Château d’Auvers, which has been turned into a museum called Voyage au Temps des Impressionistes, where you are transported back to the time of the impressionists. We learned about the impressionist movement and how it began. The museum was very well set up, and each time we entered a room, the audio commentary would begin to explain exactly what was being presented. The children were thrilled to visit the excellent gift shop when our visit was finished. They were able to buy souvenirs for themselves or as presents. In the afternoon, we visited Auvers sur Oise with a specific focus on Vincent Van Gogh. Van Gogh came to Auvers sur Oise at the end of his life, and he spent 70 days there. During those 70 days, he painted 72 paintings, more than one a day! Our guide showed us some of Van Gogh’s art and explained that through his art, one could easily see how he was feeling when he was painting. There were several paintings that had bright, cheerful colors, and they indicated his contentment. Others with dark, somber colors showed his depression. 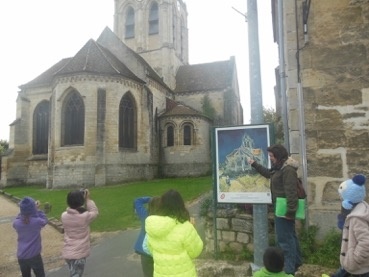 We visited the church in Auvers sur Oise that was a subject of Van Gogh’s paintings. We saw one painting of the back of the church with a woman walking towards it. We then walked up the hill to the fields and to the cemetery to see the gravestones of Vincent and his brother Théo, who are buried right next to each other. Van Gogh was only 37 when he died. Six months later, Théo passed away as well. Day 6: We had a great day in Blérancourt. This morning, we visited the Monument aux Morts, and read the General de Gaule speech sent from London on June 18th, 1940 that was posted there. In the afternoon we headed over to the Museum at the Château de Blérancourt, where we were met by our guide Catherine. She explained some of the history of the château. We visited the north pavilion that is restored as the guesthouse just like Anne Morgan had it set for her visits to help the civilians of the region between the two World Wars, and we learned about the restoration of the furniture, the tapestry on the wall, and the building. Then, we went outside to learn about the masks (mascaron in French) located on the walls of the château. Catherine showed the children several examples of these masks in order to inspire them for their activity. She explained that they would be making their own using only natural components. Each student was given a large piece of clay and a bucket of water. 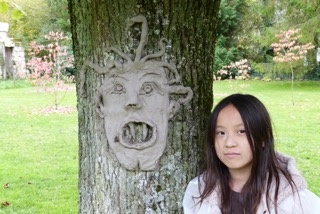 They worked their clay and then when it was flat enough, they each chose a tree where they would make their mask. Each one had a tree as his/her easel, and they were running back and forth joyfully finding the perfect tool to complete their masterpiece. It was wonderful to see our little artists at work. All of the masks were incredibly different, and the children each had a picture taken with their creation as this was an ephemeral natural art piece that cannot be taken home.